No picture. No video. No idea why I called the phone number, set up a date to see her or drive the hour to do so. I could say that I made a mistake. She was 150lbs underweight, belly bloated with worms, huge chunks of hair missing, hooves grown over shoes that hadn’t been taken off in over a year and a very shut down attitude towards the world. Fugly little mare back in 2009. In the early days I swore I made a mistake. I left the barn in tears more often than not. I tried my hardest to get her to do anything. Even just walk. But she wouldn’t. She’d stand perfectly still while I nudged, clicked, tapped with a crop, kicked, yelled. Not a hair would flinch on her body. And then right when I gave up trying, she’d bolt wildly around all crazy. Not necessarily safe but not mean either. She just had no interest in pleasing me at all. Snowy, craptastic Ohio winter day when we went to go look at her. The best thing I did was move to WI away from the prying eyes and pieces of advice of only partly sane horse people. Once there she was housed in my backyard (we had a sweet set up of renting the second house on a boarding facility until we got evicted when the land owner gambled our monthly rent away and the property was foreclosed on) and I had all the time in the world to slowly work with her and show her that I wasn’t going to leave or ask her to do anything unfair. It took until year three of our time together before she let me in. Then everything changed. I’m biased, sure, but damn!!! Look at her now. This was taken this summer at our rental. In the last eight years Gem has taken me from clueless, but loving horse owner who was mostly a passenger to a much more educated, independent horsewoman and an active, thinking rider. It hasn’t always been fun. It’s likely never going to be pretty. But it has been worth every second of effort I’ve put into her. Part of me wishes I had blogged at the beginning but mostly I’m glad I didn’t. I’m sure everyone would have just told me to sell her back then and what a shame it would have been to lose out on all these experiences. Gem went from not able to walk under saddle to bolting madly to having a trainer tell me she’d never be able to canter to becoming a 100 mile endurance horse cantering the first 30 plus miles nearly straight and is now jumping 2′ fences and schooling over starter sized cross country fences. She isn’t easy but neither am I. I think we do okay together and even with all my complaining on here about her I have no interest in looking at the world through any other ears. Here is to many more years with my Gemmiecakes! My new favorite social media saying is “if you’re not doing, you’re just spewing”. Hitting like, sharing and ranting on social media pretty much helps no one if action isn’t also being performed in the background. 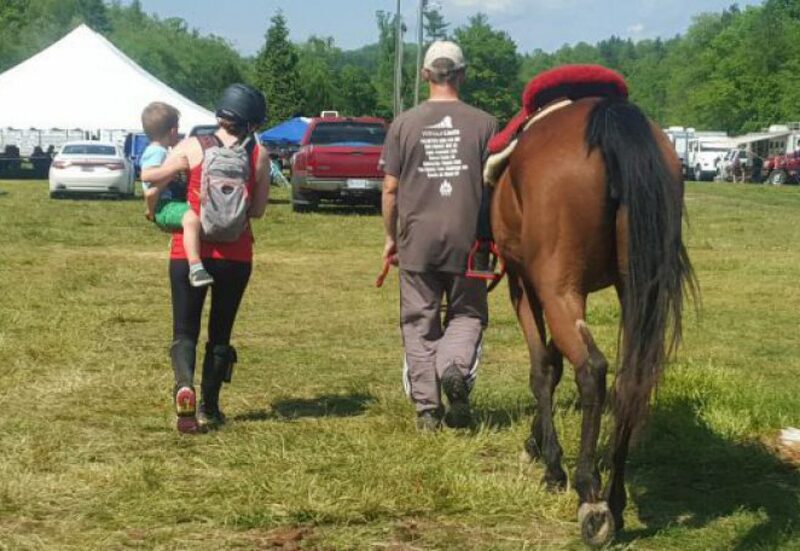 A while back I wrote about volunteerism in horse sports and how necessary it is to keep things moving. Without volunteers shows can’t happen. In order to be a doer and not a spewer, I’ve decided to put together a way to entice others to put more time into volunteering. Introducing the 2018 Call To Volunteering. 1) Sign on up by commenting on this post. You have until January 12th to do so. I had meant to do this before December ended but um…I got a bit busy. 2) Keep track of your volunteer experiences throughout the year. You’ll need to give me the name of the event, the position worked and the number of hours worked. You can do that by adding a comment on this post, on any other post throughout the year or on the page I will be creating once I have the names of those joined. Get the time sin as soon as possible after the event, but at the very least they need to be in by the end of each month. 3) Every hour of volunteer time equals one point. So a four hour dressage scribe position grants you four points. 4) The event can be local, schooling, fun or recognized but must be a real event. Clinics and camps don’t count. I reserve the right to contact the event to verify that you worked it though that will be unlikely. 5) Any equestrian discipline counts. It doesn’t have to be one you compete in and you don;t have to compete at all yourself. Besides a feeling of warm fuzzies for giving back you mean? This contest is in its infancy and my dream is to grow it pretty big over time, but for now it’s being funded by yours truly with a smaller than I’d like budget. I’m working on getting sponsors and will be reaching out to various companies. Again, meant to already do that but time slipped away. 1) Each month a random drawing will occur of all those who submitted times for that month. These prizes will be small, under $20 or so, and will be announced at the end of each month. This will reward anyone who got out there and give everyone an equal chance to win something regardless of how much time they can donate. 2.) Each quarter the participant with the most points for that quarter will get a prize package. Currently it is a Riding Warehouse gift package valued at $50 for the first quarter. As time goes on I will announce the following quarters. If I can get sponsors as planned, this package will grow and grow and grow. 3.) Overall yearly points will continue to accrue, so don’t worry if you have a slow quarter or two. You can always pick back up! 4) Year end will see the person with the most number of volunteer hours spent receive a monogrammed horse cooler. It will have “2018 Volunteer Challenge Champion” or something like that on it. 5) Year end reserve champion will get a nice leather halter with an engraved plate. So that’s it. I’m very passionate about volunteering and giving back and this is my way of enticing others to get out there and spend some time working these events. Hopefully it is a fun way to grab some cool prizes too. Remember, it can be any position at any event in any discipline. Get out and volunteer people! Oh and feel free to share this far and wide. The more who participate the better it will look to sponsors and the better the prizes will be. I can only spend so much on my own. The ink wasn’t even dry on our closing papers and there I was paypaling a crap ton of money to a stranger for a pony I hadn’t even met. There wasn’t any reason I had to add the stress of purchasing and transporting a pony from out of state on top of buying a house, moving, and filming for the show. The idea had gotten into me though and it just had to happen. Right then. Right after I posted on here my lament that there were no ponies to be found, I stumbled on a FB group called “Packer ponies and horses for sale”. Huh. Sounded pretty perfect. It opened up my search nation wide and I immediately saw that there were a lot more prospects in my budget outside of my region where the same type of ponies were being listed for double or triple the price. Early on I stumbled upon an ad for a nice looking welsh gelding. He did it all: w/t/c, 2′ jumps and trail rides. He was listed at the top of my budget and was located in RI which turned me off of him at first. Having just expanded the search, I was hoping to find something closer and less stressful to coordinate shipping. As time wore on though, I kept going back to his ad and comparing everything else to him. Finally I caved and contacted the owner. A long conversation ensued and next thing I knew I was sitting in the lawyers office sending over money to a stranger hoping the pony really existed. Next up was the stress of finding transport but it turned out to be extremely easy with living so close to Aiken and all the northern transplants heading this way for winter training. I ended up with several options and chose a delivery date of 12/22 (today!!!). The last week flew by with moving and filming and I loved the seller who kept me in the loop with regards to the health certificate, shipping conversations and how he was doing. She sent me the bill of sale, a copy of his Coggins and the health certificate. And then this morning I saw the truck pull up and my new love unloaded. His stats: 9 year old 12h welsh pony. Broke to ride w/t/c, jumps to 2′, auto lead changes (um…yeah he is better trained than Gem). Not registered, but I don’t care. He is a gelding. Super easy going nature, been on trails and around kids. Perfection. Without further ado here is the first of many photo spams of Nash. Wyatt hasn’t met him yet so be prepared for that post coming up 🙂 Doing this on the app is driving me crazy but I don’t have internet at home yet. Sorry for any inevitable funkiness in this post. His little head poking out the trailer window already stole my heart. His tiny little ears stole my heart! We sectioned off a smaller paddock in front of the arena to let him stretch his legs and have a small quarantine period. I let him off the lead rope and spent time walking away, going back and catching him again, letting him off, jumping around, making loud noises. He could have cared less about any of it. Since he came from snow and hasn’t had green grass in months, I let him out for about half an hour and then tucked him away in a stall with a big pile of hay. He was drinking great, peed clear and by the time I had to leave to make it to the OR (to sit here and wait while my case got bumped) he was settling in for a nice nap. Wyatt will get to meet him tonight after work and then we will likely have some monitored meeting time with the Dynamic Duo tomorrow and Sunday. I can’t wait to see Wyatt’s reaction when he meets his new pony. And now all my December craziness is complete. Life should return to normal soon. Waggy says that life on the farm is exhausting! Phew! What a whirlwind this past week has been. Last weekend we moved into the new house and even though this is move number eight in thirteen years and I should be a pro by now I completely forgot how awful it is. Add to it that Dusty had to work Saturday morning, so we packed the truck Friday night and then my parents came and helped me unload Saturday morning. If a piece of furniture was moved, I was holding one end of it. I could barely function come Sunday. The Dynamic Duo are settling into the new routine of coming inside to eat. It looks a bit silly having only two horse heads down such a long barn aisle. Having moved so much I’ve come to learn to not stress at all about it. The first time I moved, way back in 2006, everything was a big deal: how the boxes were labeled, where the furniture ended up, how the kitchen was unpacked. I was a big ball of unfun. Since then though I’ve learned a few things: something important will be forgotten, something you love will get broken and no matter what your furniture will never fit the way you expected/wanted it to. So now I just roll with it and shove boxes wherever, put the furniture however it best goes and deal with the rest. It’s much easier that way than to fight it. There has been something else up my sleeve too which I haven’t been able to talk about until now and has added to my already full schedule of end of year work and the move. We are going to be on House Hunters!!!!! Unfortunately I can’t spill much beyond that. All filming is complete and it was a total blast. It required a bunch of time off work and a bit of shuffling around, but I would do it again in a heart beat. It helped that our field producer, Joe, was amazing. He kept us all in track somehow between all the laughter and screw ups. I haven’t laughed that much in a real long time. We have no clue when it will air, but I’ll be sure to post it so everyone can laugh at me. Gem should make an appearance or two as well. For anyone local, or who wants to take a trip, we are going to have a major viewing party when it airs (we get a dvd copy) with an outside projector screen and a bonfire. All who want to come are welcome! Gem staring me down through her new fence wondering what I’m up to. Now that that is completed we are returning to our normal, way less fun, lives and trying to get settled into the new routine. Each house we have lived in has dictated its own flow and we are in the early stages of figuring that all out. I have managed to ride, and jump! !, once in the new arena which was nice and as we get past the holidays hope to return to my 2-3 day a week riding schedule again. One more big happening is about to be ticked off my to do list on Friday this week and then life will settle back down once again.